Filipino cuisine has been influenced by native tropical ingredients as well as the cooking styles and foods of Japan, Malay, China, Spain, America, Asia and Latin countries. Rice, coconut, and bananas figure prominently in many Filipino desserts. Like the popular yema cake, where strong cheese garnishes the top, sweet and salty is a favorite combination for other desserts. This Filipino dessert is popular year-round but especially at Christmas time. It is made from rice flour and coconut milk and traditionally cooked in a clay pot lined with banana leaves. 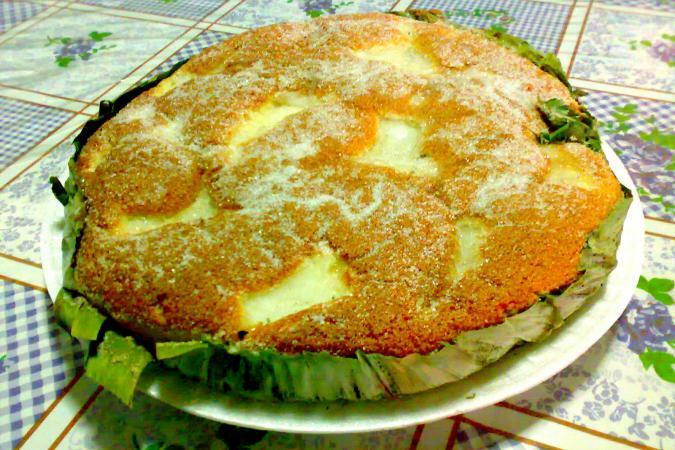 Modern cooks use ordinary cake pans lined with banana leaves (available at Asian markets) in a conventional oven. The dessert will lack the smoky charcoal aroma of the clay oven but otherwise taste the same. Traditional recipes call for salted duck egg (a brine-preserved egg) but it is perfectly fine to leave this ingredient out. Bibingka should be served hot or warm. Heat oven to 375 degrees F. Line the bottom and sides of a 9-inch round cake pan with banana leaves and set aside. In a small bowl, whisk together rice flour, salt, and baking powder until well mixed. Set aside. In a medium bowl, cream butter. Add sugar, 1 tablespoon at a time, beating until smooth and fluffy. Add the eggs, beating until well incorporated. Gradually add the rice flour-salt-baking powder mixture to the creamed mixture and beat until well combined. Slowly pour in coconut milk alternately with whole milk while beating continuously on low speed until smooth. Beat on medium speed for 2 minutes. Pour batter into prepared pan. Bake for 15 minutes. Remove from oven and top with optional sliced salted egg and grated cheese. Return to oven and bake 15 to 20 minutes or until the top is medium brown. Remove from oven. Brush with melted butter, sugar, and grated coconut. Slice and serve while still warm. This Filipino dessert's name means "mix-mix" in English and consists of a number of ingredients layered in a glass or clear container. They are mixed together by the diner when ready to eat, hence its name. There are no real rules for ingredients but they usually consist of a starchy base like boiled beans, corn or tapioca, syrupy fruit, flavored gelatin, shaved ice and ice cream. The tapioca should be soaked overnight, so plan accordingly. Bring 4 cups water and 3/4 cup sugar to a boil in a 2-quart saucepan. Add the soaked and drained tapioca and return to a boil. Reduce heat to a simmer and cook until the tapioca pearls are clear, stirring occasionally for about 30 minutes. Rinse with cold water to stop the cooking process and drain off any liquid. Allow to cool completely before assembling the dessert. Peel mangoes, bananas, and jackfruit and cut into 1/2-inch cubes, discarding any pits or seeds. Set aside. Prepare 4 tall glasses or sundae dishes. Divide each ingredient into 4 equal parts. In each glass or dish place 1/4 of each ingredient, starting with corn or chickpeas, yams, tapioca, mangos, bananas, jackfruit, coconut, and gelatin. Top with 1/2 cup shaved ice. Pour 1/4 cup evaporated milk over shaved ice and top with a scoop of ice cream. Garnish with optional nuts or rice cereal and serve. 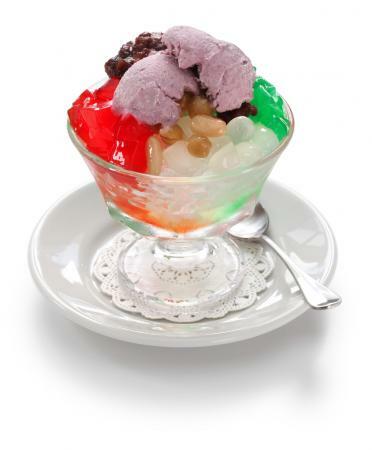 Let guests mix their halo-halo or eat it as-is. Spanish cuisine firmly entrenched itself in the Philippines in the 16th century during its colonial period. As such, many popular Filipino desserts like leche flan and pulburon are kissing cousins to Spanish flan de leche and polvorones. In some cases, ingredients and methods of cooking differ but they essentially are the same. You wouldn't go wrong serving either of these at a traditional Filipino spread.